Rylstim Budget Lite, has only one restriction, it can handle up to two accounts only. No other restrictions - neither by time, nor by functionality. Completely new, yet the simplest way to keep an eye on your money daily is to use calendar. But to not merely look at it the way you did it before - record your revenues and expenses right on the calendar. With the calendar accounting, you can easily see your financial state for the current month, review your last month's expenses and, most importantly, properly plan your upcoming income and expenses. 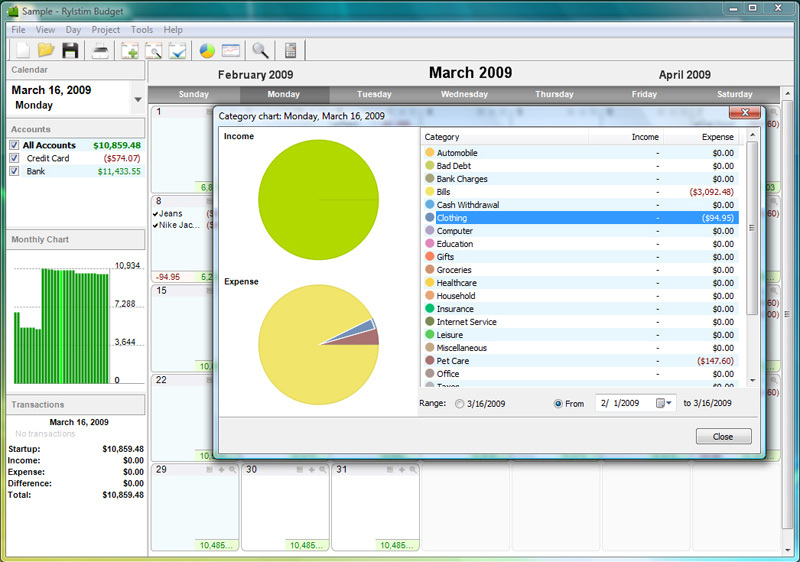 The software includes all necessary money management functions. You can maintain multiple accounts simultaneously, manage different income and expense categories. You can even set limits for expense categories and be notified when these limits are exceeded. The program offers 6 different types of reports and allows using those for generating custom reports. The multi-currency support is designed to let you completely forget about any problems with transferring money between accounts in different currencies. Our idea of multi-currency appears to be unique, therefore, this is the only application where today's exchange rate for Euro differs from the yesterday's and, certainly, from the one that was current two days ago. These are just the basic functions and distinctive features of the software. To this day, Rylstim Budget is a perfect solution for managing personal finances, ideal for home users and for freelancers. This site does not contain serial number, crack, keygen Rylstim Budget Lite serial number : serial number is the simplest type of crack. A serial number(cdkey,product key,etc) is register the program as you may already know. a crack or keygen may contain harmful software. If you cannot find the exact version you want, just give it a try. for more information read .nfo/.txt/.diz file include in zipped file.